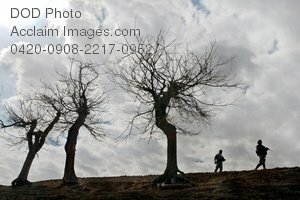 Description: Free, public domain image: Two Soldiers Walking By Dead Trees Along a Mountain Ridge. U.S. Army 1st Lt. Jared Tomberlin, right, and an interpreter descend a mountain ridge during a reconnaissance mission near Forward Operating Base Lane in the Zabul province of Afghanistan Feb. 28, 2009. Tomberlin is assigned to Bravo Company, 1st Battalion, 4th Infantry Regiment. (DoD photo by Staff Sgt. Adam Mancini, U.S. Army.